No Time to Despair. Let’s Get Busy Creating the Future! The Trump victory has shaken us to the core. It’s a complete repudiation of the values we hold dear. We are awakening to a different view of the work ahead, marked by grave uncertainties. What will happen to US commitments to address climate change? The food stamp program? Immigrants? Basic civil rights? Our Democracy? A change in leadership does not mean that the movements we champion and work to advance will disappear; if anything, our energy and resolve are invigorated. We remember what it was like working under the Bush/Cheney Administration, and how important our local efforts turned out to be in keeping things moving forward. Again, we feel an increased urgency and a deeper need to build our base – to resist the reversal of our successes, defend vulnerable segments of our community, and extend our local impact. Can you support our mission through these challenging times? Citizens prevailed against the plastics lobby and made California the first in the nation to enact a statewide plastic bag ban, reducing the flow of plastic pollution into our waterways and ocean. Built on early piloting at our Farmers’ Markets, Prop 67 won thanks to a coalition that included grocers, communities of color, the recycling industry, ocean and coastal protection groups, and nonprofits like us! Driven by our deep familiarity with our waste system and its limits, the Ecology Center is gratified to see our decades-long leadership and advocacy come to fruition. Citizens in Albany, Oakland, and San Francisco – as well as in Philly, Boulder and Chicago – carried soda tax measures to victory. The tide is turning against Big Soda, kickstarted by Berkeley’s successful soda tax, which the Ecology Center deftly championed. After years of defeating similar measures, Big Soda can no longer stop this movement. These soda taxes will reduce excessive sugar consumption and save lives while raising revenue for programs that support healthy kids and communities. In early October, the Alameda County Board of Supervisors voted unanimously to form East Bay Community Energy – establishing a game-changing new way for citizens to purchase energy. Instead of paying PG&E to buy dirty electricity on your behalf, with profits enriching PG&E investors, you’ll be able to buy cleaner energy from a county-level agency. The profits will be invested in locally distributed renewable energy projects, creating jobs and increasing our energy resiliency. Community Choice Energy (CCE) is a juggernaut, hastening a just transition to a clean energy economy. At this point, 26 of California’s 58 counties either have operating CCE programs, are on schedule to launch service, or are evaluating the possibility. 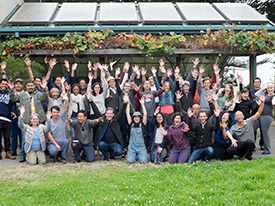 The Ecology Center and Berkeley Climate Action Coalition are proud of the work we did to make CCE bloom in the East Bay. The federal government moves like molasses, for better and for worse. Trump has promised a litany of deplorable actions. Some – like reversing Obama’s rule requiring power plants to cut carbon emissions – may take time, mirroring the same cumbersome and litigation-heavy process of writing regulation in the first place. Other actions may be swift, like the deportation of our fellow Californians, which could devastate our community. But we can’t wait around to watch his slow-motion reel of destruction. We’ll be too busy creating the future, and making Trump’s poisonous and retrograde vision of a “Great America” obsolete. California, the 6th largest economy in the world, is now the de-facto leader of national climate change efforts. California’s fleet-footed cities are where progressive ideas take root. The Ecology Center’s model of change always starts local, where we can pilot and refine our ideas, then launch them to the next level. Donations from individuals have empowered us to start a national movement to tax soda and fund nutrition education, establish a community-governed power supplier, and create a new model for the growth of youth environmental leaders from local communities most vulnerable to and affected by climate change. The Ecology Center’s efforts to inspire and build a sustainable, healthy, and just future for the East Bay, California, and beyond are needed now more than ever. Member support through the years has been invaluable in allowing us to pioneer and spearhead innovative approaches that government contracts and foundation grants won’t fund. Please give to the Ecology Center today. 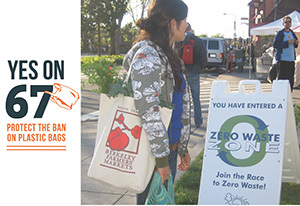 This entry was posted in Blog and tagged bag ban, climate, donate, East Bay Community Choice Energy, soda tax, support, Yes on 67 by Ecology Center. Bookmark the permalink. I started the newspaper pickup program with the help of other staff members in the 1970s and was a co-founder of Encore about the time I was starting to farm in Healdsburg. It is great to see what you are doing now. I would suggest a more complete list of personal actions people can take to reverse climate change to include things like carbon gardening. A friend of mine and I developed a power point which she gives for garden clubs which covers this. Keep up your great work.